Rendering of Penn Medicine's new Advanced Outpatient Center in Radnor. Officials at Penn Medicine broke ground Friday on a new Advanced Patient Care facility that will replace an existing facility in Radnor that has been in operation since 1997. The $200 million project will be located at 145 King of Prussia Road, the former Wyeth Laboratories. At 250,000 square feet, the multispecialty facility will be twice the size of Radnor's current outpatient center. The University of Pennsylvania Health System selected Brandywine Realty Trust as the developer for the project. They will use the western portion of the property to construct an office space and hotel with approximately 100 rooms. Officials said the new facility will provide comprehensive cancer care, including radiation oncology services and chemotherapy provided by Abramson Cancer Center. Primary care, heart and vascular, orthopaedic and neuroscience care will also be available to patients at the Radnor campus. 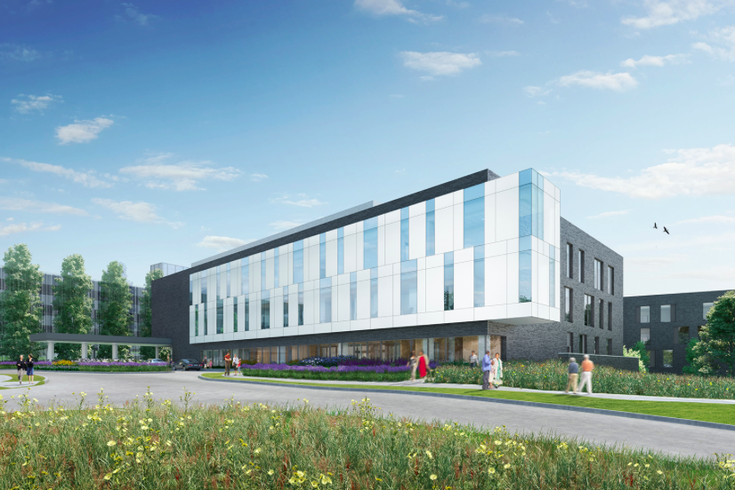 The four-story building, whose plan has been LEED Silver certified, is slated to include six operating rooms and four endoscapy suites, as well as full radiology and laboratory services. Penn Medicine will now expand on a growing list of multispeciality outpatient centers in the Delaware Valley. Other facilities outside Philadelphia can be found in Bucks County, Valley Forge, Chester County and South Jersey. The Radnor project is expected to open in 2020.